Unit 6, Heritage Business Centre, Derby Road, Belper, Derbyshire, DE56 1SW. Registered in England Wales Company No. 8028528. 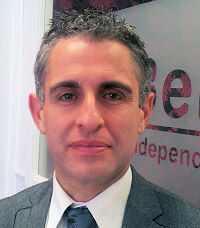 Kevin is an Independent Financial Adviser with over 18 years' experience in the Financial Services industry. He was born, brought up and educated in Derbyshire. Originally from Shirley, near Ashbourne, he settled in Belper where he has lived for the last 5 years. He has helped many types of people over the years- both young and old - to achieve some of their financial goals in life. From the rich to the less affluent, Kevin knows that everyone has a financial need of some kind, whether they know it or not. It may be an area of their finances where a few minor "tweaks" are required to maximise their financial situation. In some cases there is a need for a major financial overhaul. He enjoys helping his clients realise their financial goals, whether it is to maximise their return on their savings tax-efficiently, plan their retirement or help them save money on their mortgage. Equally it is satisfying for him to know he has helped clients protect their loved ones should the less-happy event in life occur such as unexpected illness or bereavement. Kevin specialises in providing Mortgage Advice, Wealth Management and Retirement Planning. He provides a first class one-to-one service to all his clients and provides financial planning on a face-to-face basis. For Kevin, it is about building a long lasting relationship with a client and gaining their trust and understanding of the support he can provide throughout their lives. Many of his clients like the benefit of continuity with him as their Financial Adviser and it also helps him ensure the service and advice is relevant for them. Personal professional relationships help Kevin understand what a client wants, can afford and is truly comfortable with. The ever changing financial climate and legislation opens up new opportunities for clients such as the increase to the Annual ISA Allowances. Pensions too have had a radical legislative overhaul in 2006 which has both simplified and created further options with your retirement planning. Kevin's goal is to help improve and protect the client's financial position both now and in the future. 2012, will see other major changes in the Financial Services Industry. Commissions, currently payable to Financial Advisers will become a thing of the past. The Financial Services Authority wants to implement paying for financial advice on a fee basis ensuring clients know exactly what they are paying for. The emphasis will be firmly on transparency for the client and therefore removing any doubt about what the client is getting for their financial investment in financial advice. We are pleased to say that Belper Independent Financial Solutions fully embraces this philosophy and is well equipped to meet the raised standards well before the end of 2012. Come along for the trip.